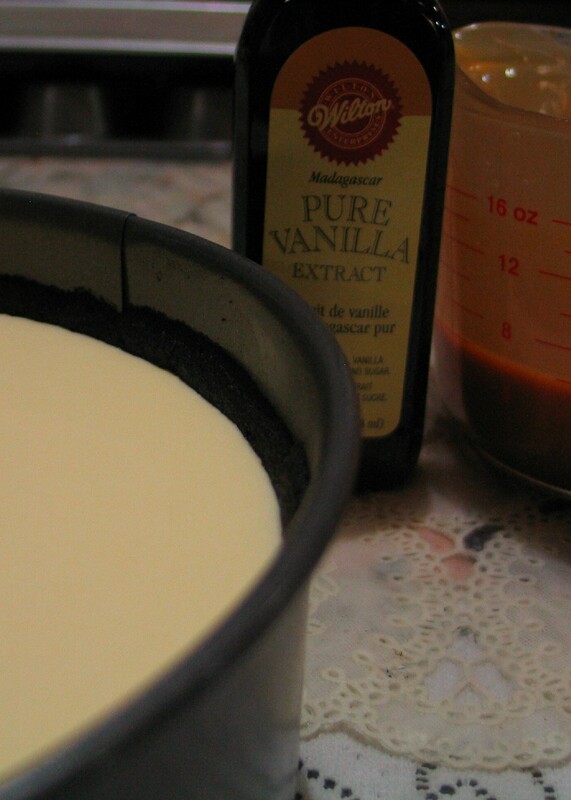 Trying my hand at making cheesecakes now. I've been thinking about this for a long time. 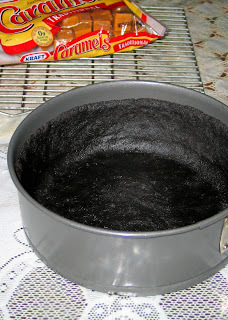 I've bought the pan and picked out the recipe three years ago. Never really got around to doing it. The last push was provided by my friends, specifically, Apple and Mennie, who even volunteered to be taste testers. Be careful what you wish for, girls. 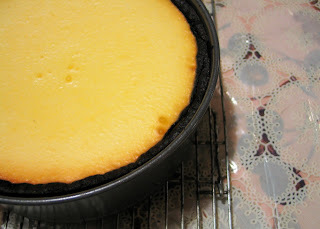 Am not really very fond of cheesecakes because most I've tried are too rich for my taste. A few cheesecakes, perhaps sensing my inherent halfheartedness for their kind, have stuck to my hard palate with such loathing that it had caused me to choke on several occasions. 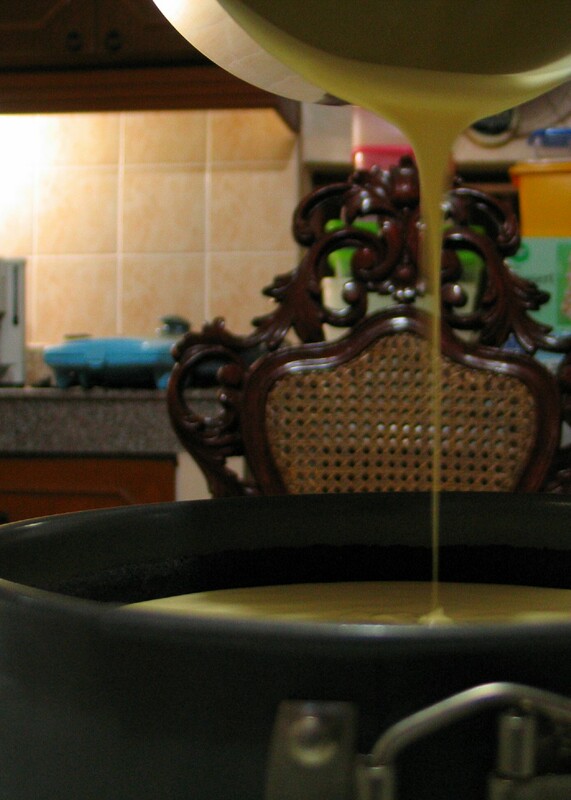 What do you expect from a cake that is mostly, well, cheese, right? Sort of like eating mayonnaise pie, if there ever was one. But there are a handful of cheesecakes that I find to be surprisingly light to the palate and taste positively sublime. The Very Berry Cheesecake from Starbucks, for example. I really really love that cheesecake, and I am not the kind that prefers dried berries in my dessert. The Chocolate Tuxedo Cream Cheesecake by The Cheesecake Factory, with its decadent layers of fudge cake, chocolate cheesecake, vanilla mascarpone mousse, and chocolate, is also terribly good in its complexity. Then there was that Turtle Cheesecake (the eponymous cheesecake equivalent of the delightful pecan, caramel, and chocolate confection, Turtles) formerly offered by Fazoli. That cheesecake was to die for. It's long been pulled out from their menu, but I still think about it until now. So I guess it's only fitting that my first crack at making cheesecakes involves a recipe for turtle cheesecake. 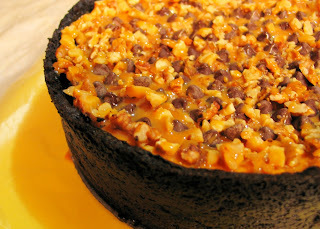 The recipe I used, the Ultimate Turtle Cheesecake, is posted here. 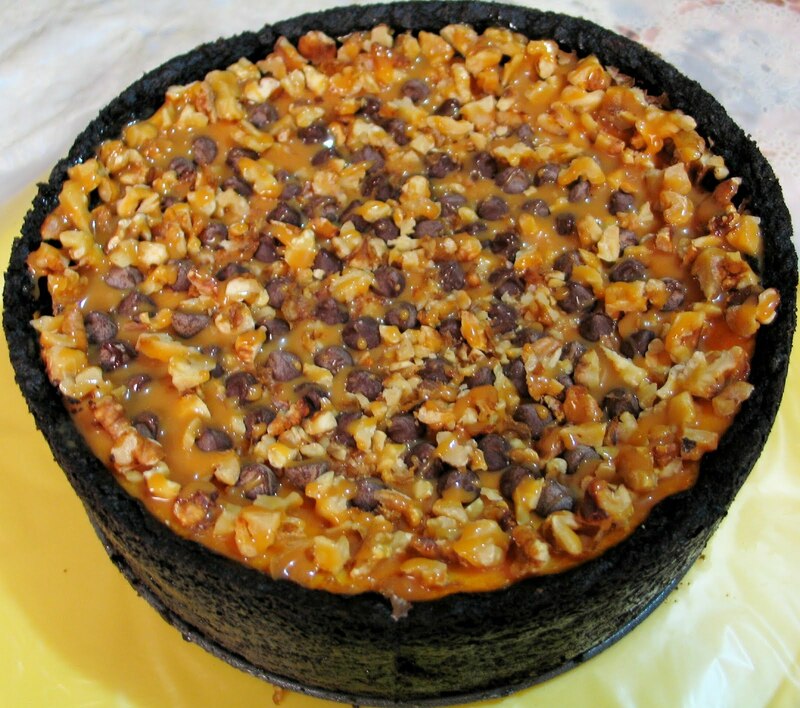 There were a couple of things I changed in that recipe- I used an 8-inch pan instead of 9, a different brand of cream cheese, walnuts instead of pecans, and topped the finished cake with 1/4 cup semi-sweet chocolate chips instead of drizzling it with melted baking chocolate. Without pecans though, I don't think I am allowed to call this cheesecake a turtle cheesecake. 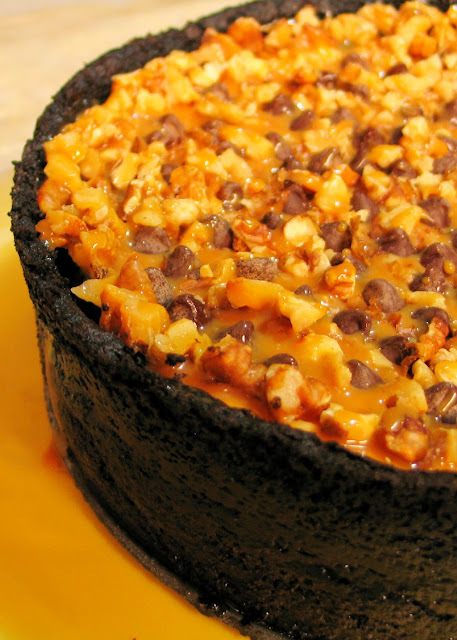 "Mock Turtle Cheesecake", perhaps? Anyway... Other than that, I think I followed the instructions to the letter. 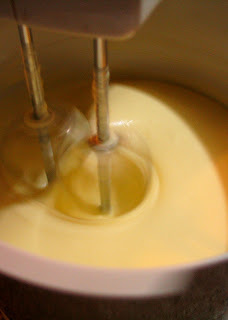 MIX crumbs; press onto bottom and 2 inches up side of 9-inch springform pan. 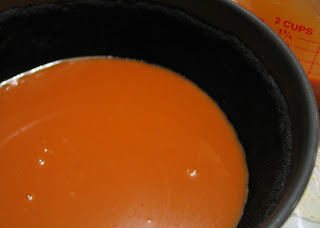 Place caramels and milk in small microwavable bowl. 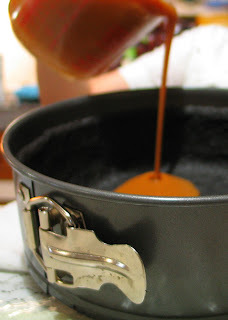 Microwave on HIGH 3 minutes or until caramels are completely melted, stirring after each minute. 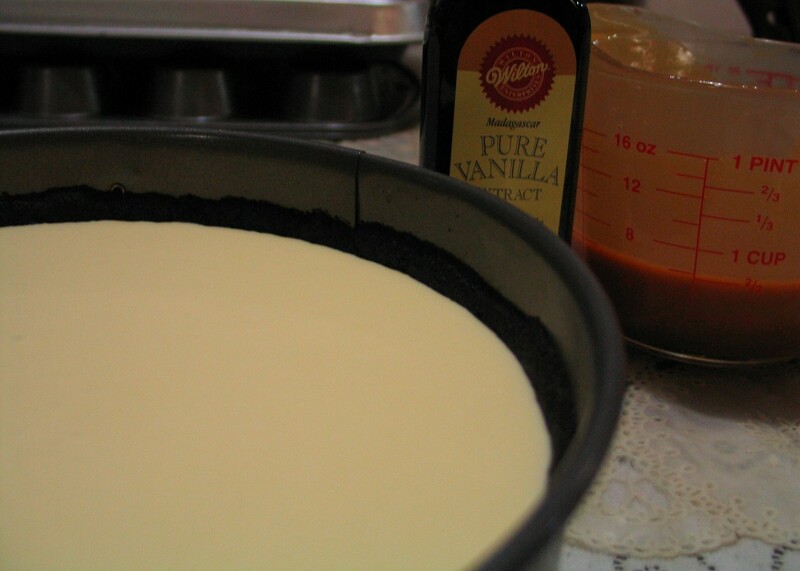 Pour 1/2 of the caramel mixture into crust. 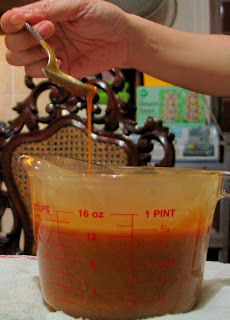 Set remaining caramel mixture aside for later use. 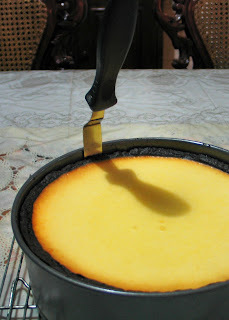 Run knife or metal spatula around side of pan to loosen cake; cool before removing side of pan. 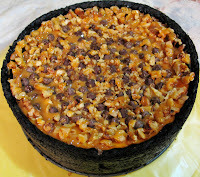 Top with remaining caramel mixture and pecans just before serving. Melt chocolate as directed on package; drizzle over cheesecake. I must say, I was pretty excited about making my first cheesecake. I think it looked pretty ok in the end, it did not crack (every perfectionist cheesecake baker's worst nightmare) or anything, but taste-wise, I am not convinced that it was up to the standard that I was looking for. So it's back to the cheesecake drawing board for me. Sorry, Apple and Mennie, you don't get to try this one. Maybe (hopefully) the next one.